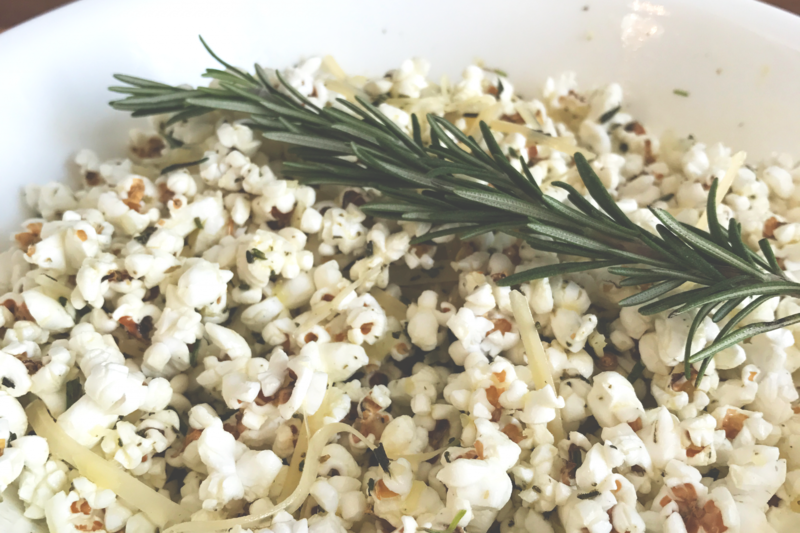 In honor of National Popcorn Day, we created a savory, gourmet popcorn snack that’s perfect to enjoy all weekend long! 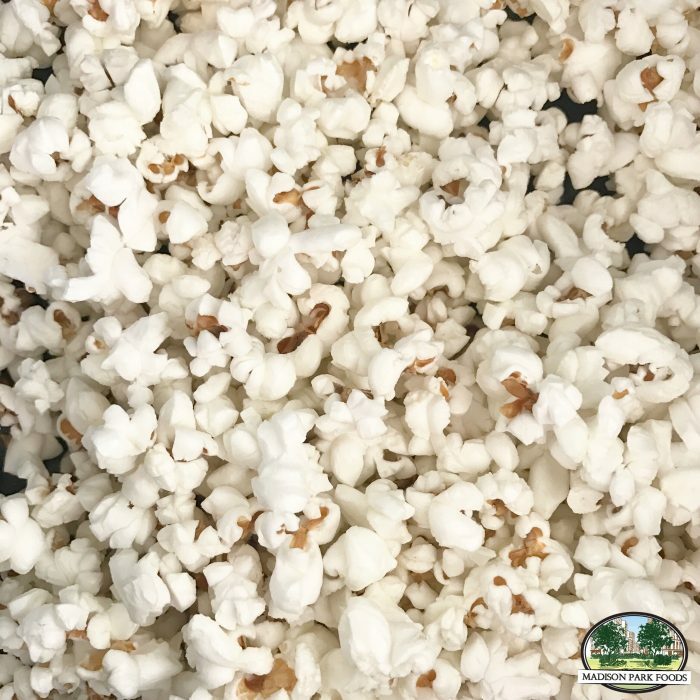 We started by popping a fresh batch of our Petite Maize Popcorn! This is way more fun than microwaving a bag. 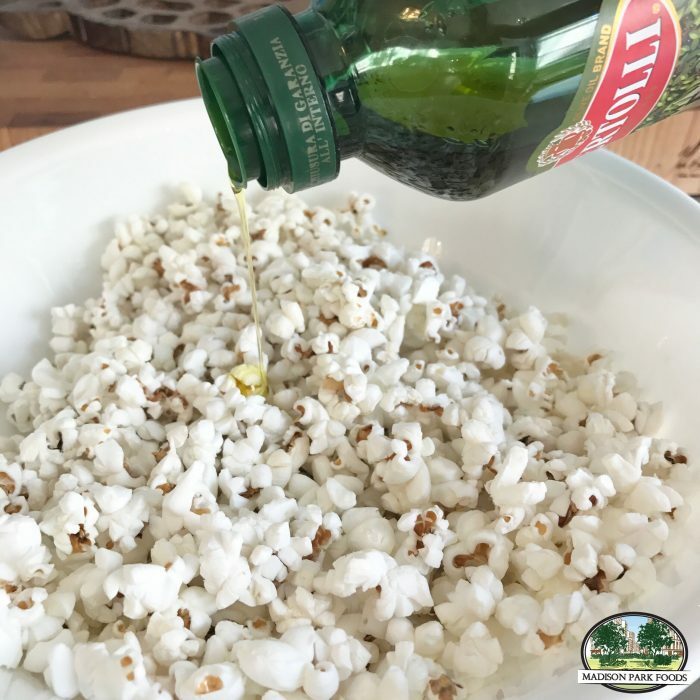 We love the old fashioned charm of a stovetop popcorn experience. Check out those gorgeous, fluffy white kernels! Our non-gmo corn is grown from an heirloom seed, which has been enjoyed by Americans for generations. There’s a reason why it hasn’t changed – it’s perfect! 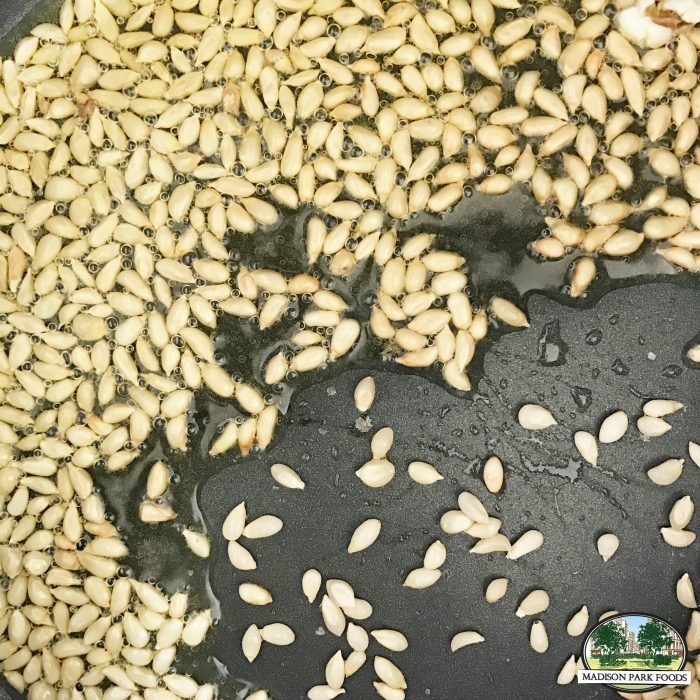 Transfer the freshly popped corn into a large bowl. 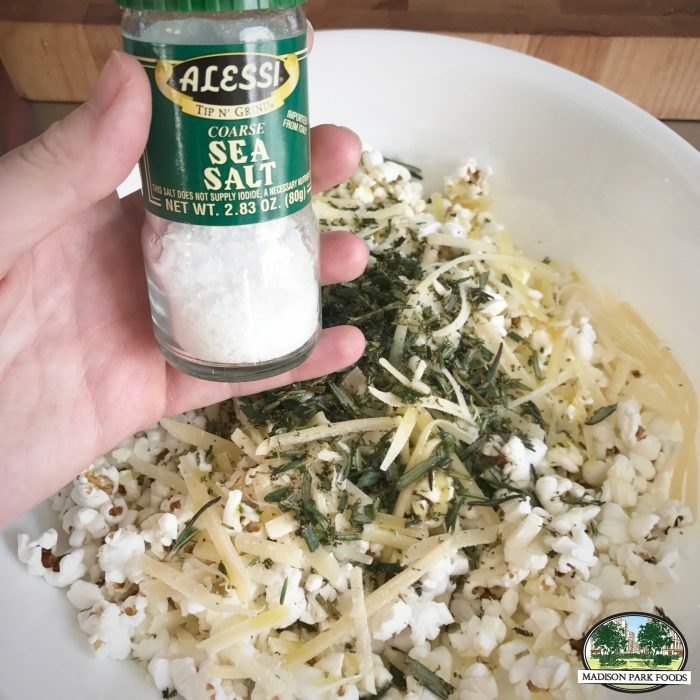 Drizzle with as much or as little olive oil as you want. It’s best to start slow, because you can always add some more later. Next, choose your favorite version of parmesan cheese. 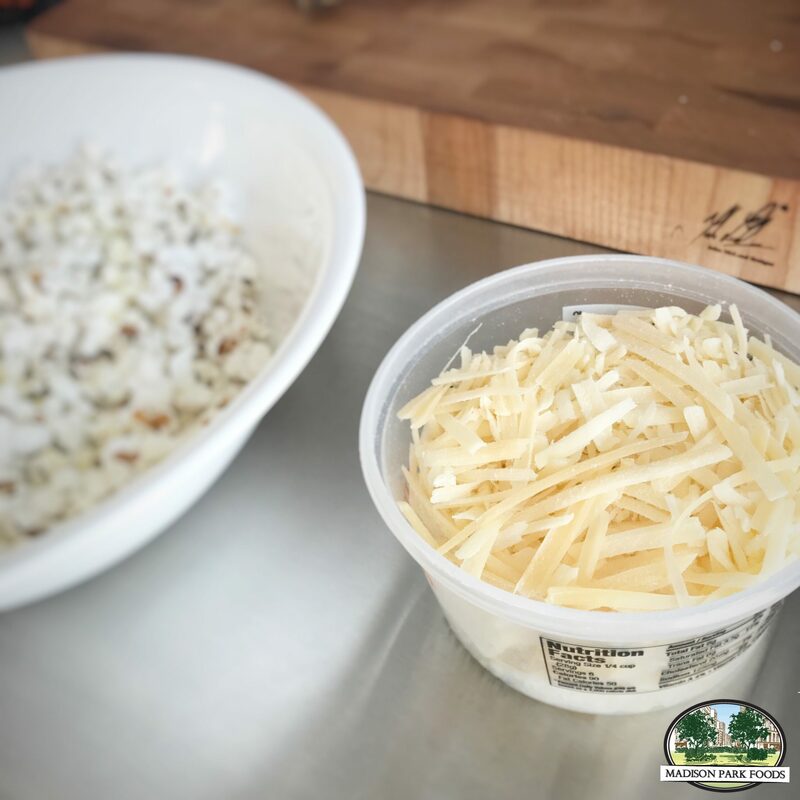 We’re using a grated cheese, but the finely ground version may work better for you. 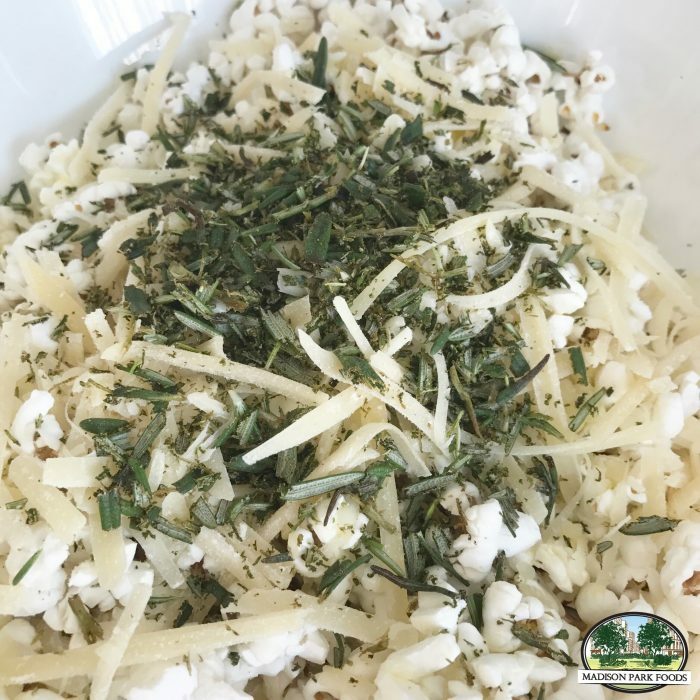 We like to get a big, chunky bite of cheese with our popcorn, but that’s a personal preference. 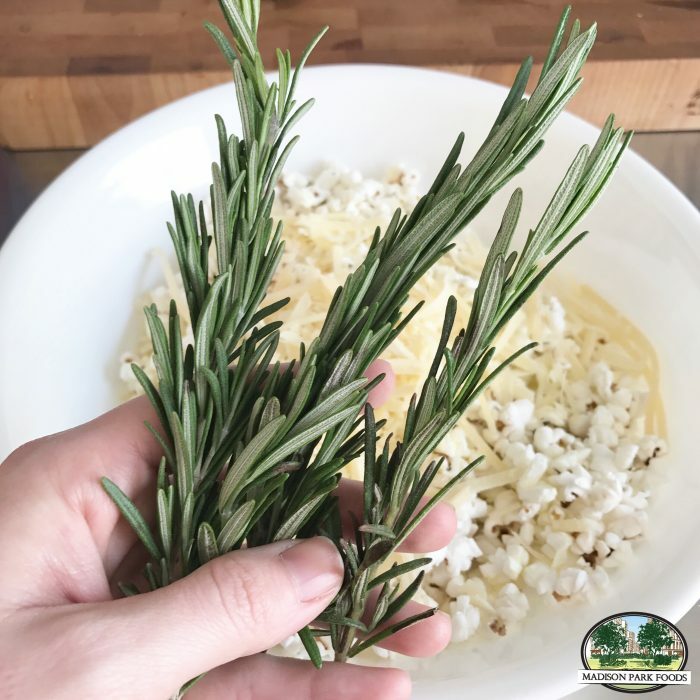 Fresh cut rosemary is key to the big, bold flavor in this dish. Plus it’s pretty! 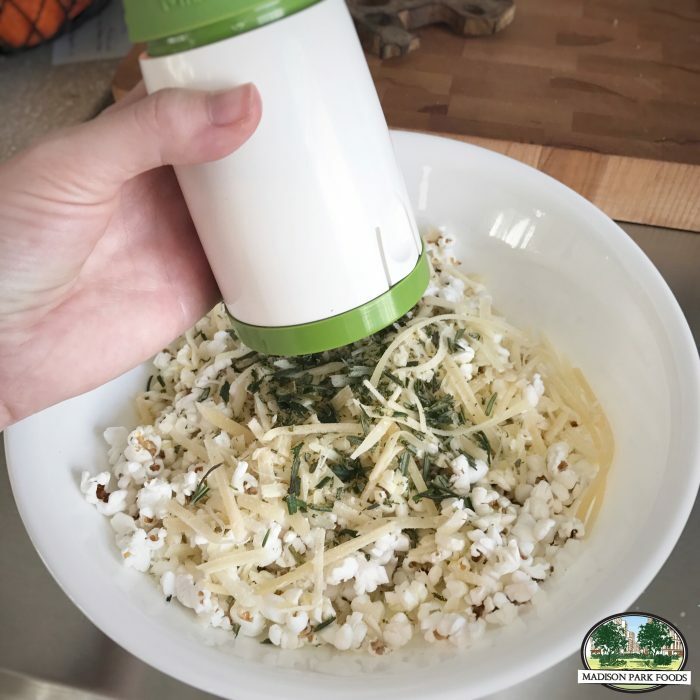 A fresh herb mill is one of our favorite kitchen tools. It’s small, so it doesn’t take up a ton of space, and it’s a culinary workhorse that saves a bunch of time. 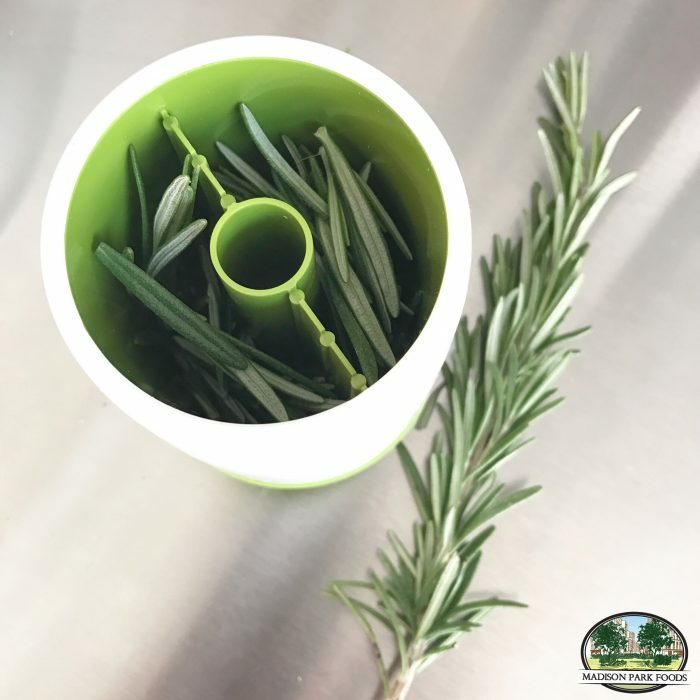 Add fresh rosemary to taste. If you want a big, bold flavor, add a little more. Less for a subtle taste. Finally, add some sea salt to pull the flavors together. It’s almost too pretty to eat….. almost. 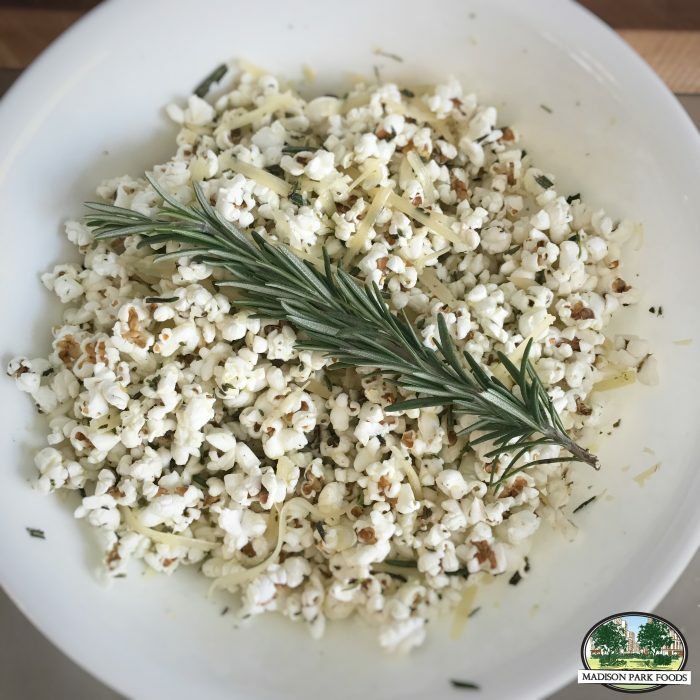 Get your own Madison Park Foods Petite Maize Popcorn here. 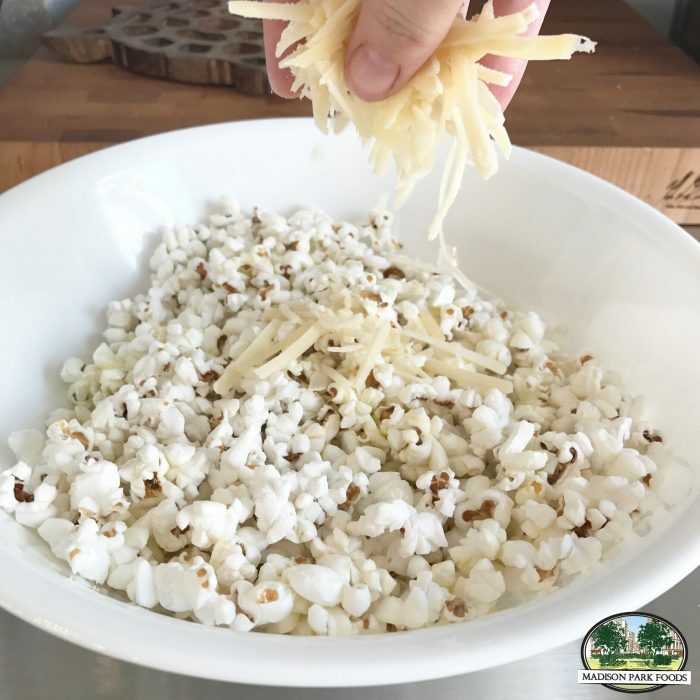 Use discount code POPCORN25 to score 25% off all popcorn products through January 22nd!